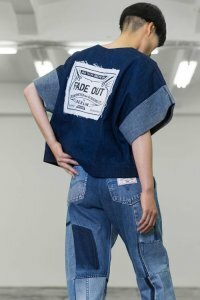 FADE OUT is a unisex line of exclusive clothing and accessories made from deconstructed vintage using handicraft methods, where the patina of used material recombined in a fresh and different way creates new unrepeatable alchemies. FADE OUT embodies a dump-to-hanger ethos and celebrates responsible recycling of materials and innovative designs. We do not believe in the timelines of the fashion system but in timeless creativity and in the originality of every single idea and item. We therefore create permanent collections to which new items are added every season. We create comfortable, unisex garments, which due to the use of recycled material become hand-crafted one- offs, repeatable but always different. All FADE OUT items adapt to various occasions and to different personalities due to their simple yet well studied oversized fit. The originality of our idea and our handicraft approach to both the creative process and the production itself outdare the overproduction, conformism and exploitation of present day’s fashion system. FADE OUT’s belief in sustainability of both material and actual production leads us to a direct relationship to our costumers, which allows custom- tailoring and made-to- measure garments.